Buying food and water bowls for your cat isn't a simple matter of picking the cutest pattern or the right size. Here are some important considerations to think about before making a choice. Although plastic bowls are generally sturdy, they have a couple of downsides. First, many cats have an allergy to plastic and develop a skin condition on their chins resembling acne. Second, plastic tends to nick and scratch, and those tiny fissures become a breeding ground for germs. It's best to avoid plastic if at all possible. Cats do not like to eat or drink from dirty bowls and dishes. Even dry food has enough moisture and fat in it to leave a film in the dish. Try to rinse out dry food bowls daily, and run them through the dishwasher at least every few days. Bowls used for canned food should be washed in the dishwasher daily. 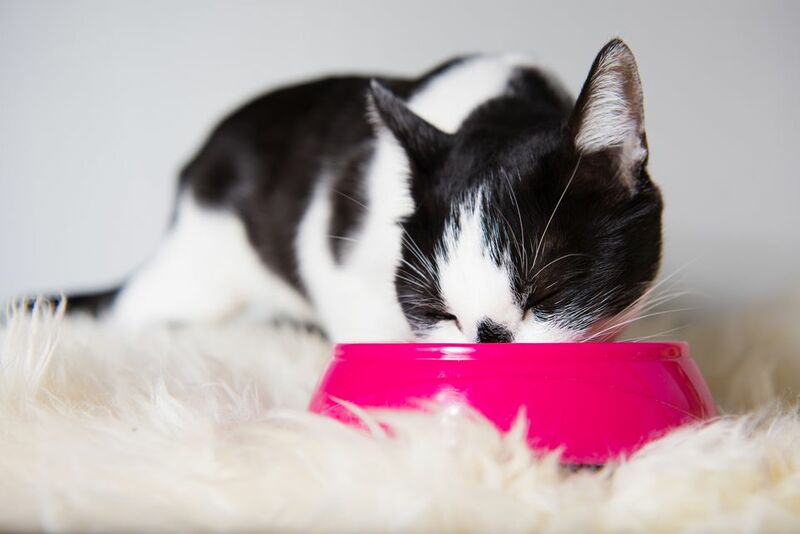 Bowls should be large enough to hold a meal-sized portion of cat food (one to two cups). The shape isn't all that important, except straight-sided bowls are less likely to tip over and make a mess. Many "designer" cat food dishes nowadays come with matching "placemats." These mats serve to anchor the dish, as well as to catch any dribbles that may spill out. You can make your own placemat by using disposable materials, such as cardboard from boxes or carpet remnants. Inexpensive plastic "human" placemats are nice too. They can be wiped off, and liquid spills don't soak through. We all have had those emergencies when you have to be away overnight, or your boss asks you to work late. Free-feeding isn't always the answer, particularly with an overweight cat. To the rescue: automatic feeders. These range for expensive electronic feeders that can be programmed over several days, to simple battery-operated feeders that will pop open at the appointed time.